Today: Cloudy with periods of drizzle...freezing on elevated surfaces early on above 1,500 feet. Highs 44-48. Tonight: Steady rain moves in by late evening...continuing overnight. Lows 40-44. Wednesday: Not a very wintry-feeling Christmas Eve. Periods of rain. Much warmer with southerly breezes. Highs 55-59. Friday: Mostly sunny. Highs 54-58. Today will be a near repeat of yesterday...lots of clouds with periods of drizzle. Some of the higher elevations are hanging out around the 32 degree mark this morning so some of this drizzle may freeze on elevated surfaces early on. Southerly flow will begin to win out and erode the wedge leading to temperatures climbing a good 10-15 degrees warmer than yesterday. Low pressure will develop over the Mississippi Valley tonight before tracking west of our area Wednesday. 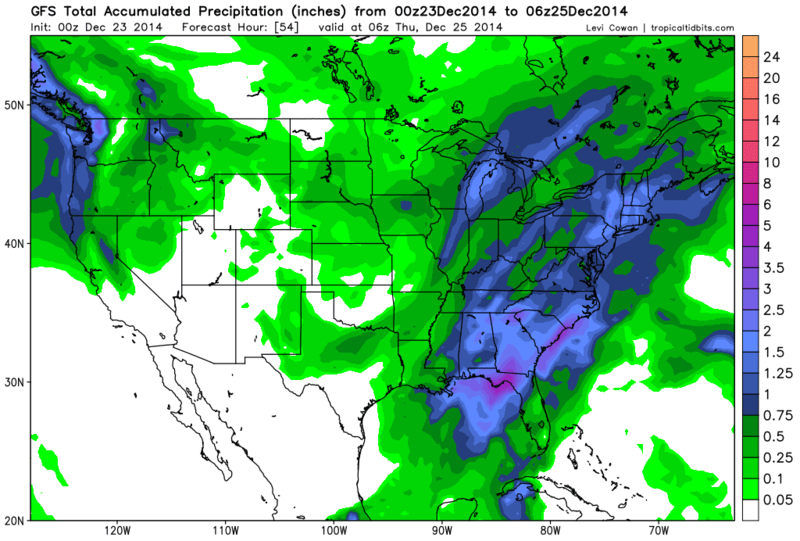 This will stream in plenty of Gulf air leading to unseasonably warm temperatures and periods of rain. We'll have one final batch of rain Wednesday night with the actual passage of the cold front. Total rain through Wednesday night will generally be in the 0.75-1.25" range...with locally higher amounts just east of the Blue Ridge. Westerly winds will pick up behind the cold front Christmas morning ushering in chillier seasonable air and upslope snow flurries/snow showers across the western facing slopes of the Allegheny mountains. The parent low will be quick to depart and flow orientation is not the best so not expecting much, if any, accumulation. High pressure works in over the area Friday leading to lots of sun and temperatures back well above average.